scorge better. nuttin. HD Wallpaper and background images in the Warriors (Novel Series) club tagged: warriors scourge. This Warriors (Novel Series) fan art contains anime, comic, manga, cartoon, comic buch, karikatur, and comics. Don't mess with dat kitteh. 1) On page 233 of "The Darkest Hour" on the last sentence of second paragraph, it says, "Blood welled out as the smaller cat ripped him DOWN to the tail in a single slash." 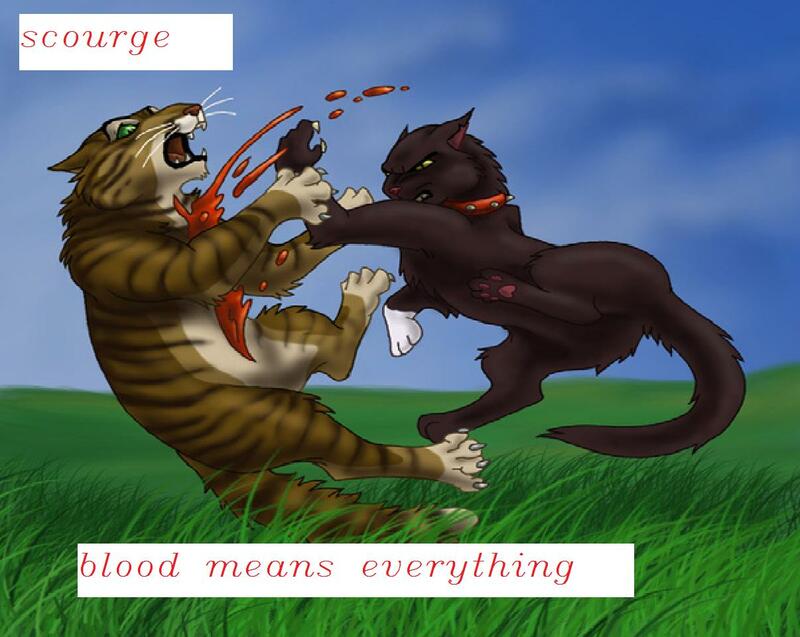 In the picture, Scourge is shown slicing Tigerstar from the tail UP, not from the throat DOWN. 2) Tigerstar's eyes are AMBER (See pg. 3 of "Into the Wild"). In the picture, they're GREEN. 3) Scourge has ICE-BLUE eyes (see pg. 5 of "The Darkest Hour"), not amber/yellow, like here. 4) Scourge's collar is DARK PURPLE (See the cover of "The Rise of Scourge), not red. hey its not my pic god but do you think it is good oh and in japan scourges collar id red so haha! this is ravenpawrox i switched accounts! !